Friends who follow me on Twitter won’t quite be able to believe their eyes when they see this picture. 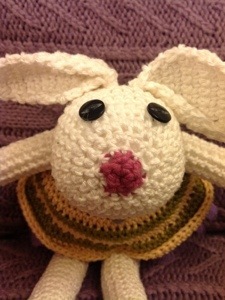 May I present to you… Betsy Bunny! Parts of Betsy have been on my crochet hook for a few weeks now, ever since I got my hands on Sara Sinaguglia’s fabulous book, Simple Crochet, published by Octopus Books. 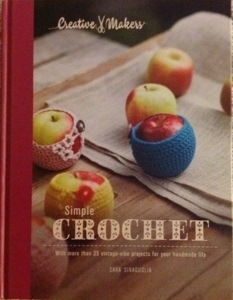 My next crochet project from the book will keep my chilly feet happy – slippers! Keep your eyes peeled here for slipper progress. Anyway, back to Betsy. 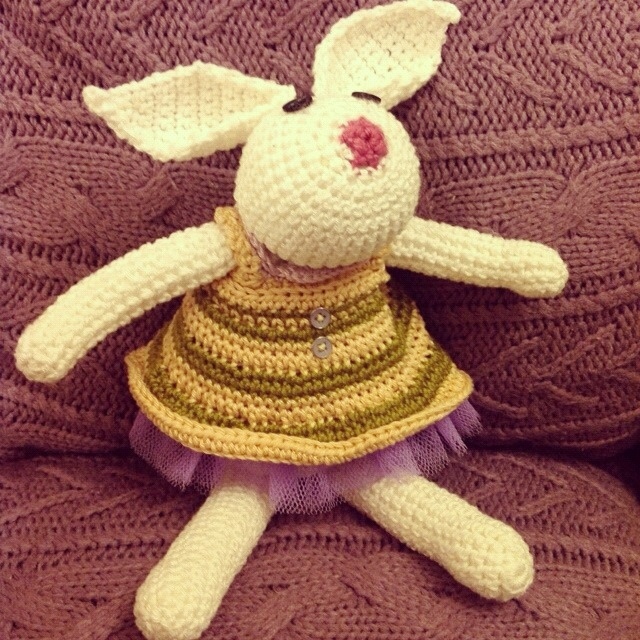 Sara’s rabbit is called Olympia, and seeing her inspired me to crochet a sibling for the Moo’s sixth birthday. And here is Betsy. Isn’t she pretty (even though I say so myself!)? Sara’s pattern was easy to follow. The hardest part for me was getting two legs to match (I don’t know why). Her owner is very impressed with her new charge, and has welcomed her into her boudoir with open arms. This project only leaves me with one question to you, dear reader – could you draft me a pattern for an adult-sized vision of Betsy’s dress, please?